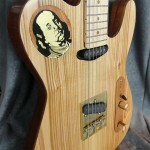 This guitar was finished in less than two months during a MIMF challenge to build an electric guitar with parts totalling less than $100, and it was completed just prior to Halloween 2009. The body was made from an old mahogany desk given to me by a friend. The pieces were sanded down and sandwiched to make a reasonable body thickness. 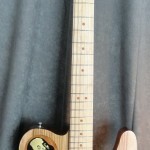 The top and neck were made from ash given to me as well. 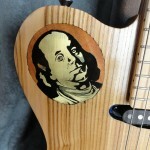 The inlay was made from kickplate brass and record vinyl which worked very well as a black inlay material. 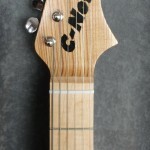 The control cavity cover was made of cherry and the knobs were made from a maple/cherry laminate left over from a previous guitar neck. The bridge was also made from kickplate brass. 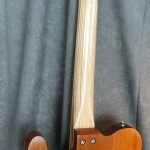 The trussrod was made from rolled iron stock, and the pickups were made by me. The electronics, bridge barrel pieces and tuners were purchased.